We've reached 56,868 of our goal of 75,000. 88%	We've reached 66,547 of our goal of 75,000. 91%	We've reached 68,603 of our goal of 75,000. Collected to stem against Donald Trump and his following of Trolls. They may not have realized, with their exuberance for allowing the demise of our democracy, that there is no room for a Senate in an authoritarian government. Michigan's attorney General joined in the signing of California's Federal lawsuit against using the National Emergency Act (as a ruse) to procure funding for the border wall. 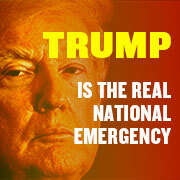 The border wall is not a national emergency: The Act exists to abate property and personal casualties due to weather (flood, mudslide, hurricane, tornado, earthquake) and fire. Michigan joined 15 other states on the lawsuit, to date. Petition signed, shared and noted. Thanks, Animae. Previously signed but thanks for posting so we don't have this racist wall being built.